We have been using Nevigo’s articy:draft a few months now, and all we can say is that we can’t think of a better tool for our workflow. 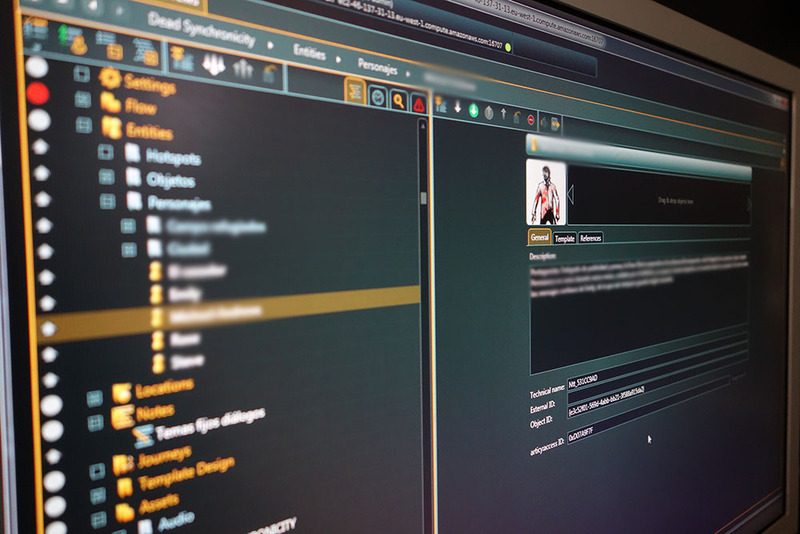 The ability of having all the elements of our game together in one single software, featuring one single interface is awesome; we have created locations, characters, items, hotspots… and now we can connect one another the way we like. For instance, we can place items on their specific place inside a location. We can create “exit spots” and link them to another location, so that we can make a simulation of the player exploring the fictional world we have created. We can customize the profile of each category (items, characters, hotspots) so that we can add as many fields as we want, and use those fields the way we like: to include the “description” the player will read and hear when examining an item, to state how to use that item… just anything you want! 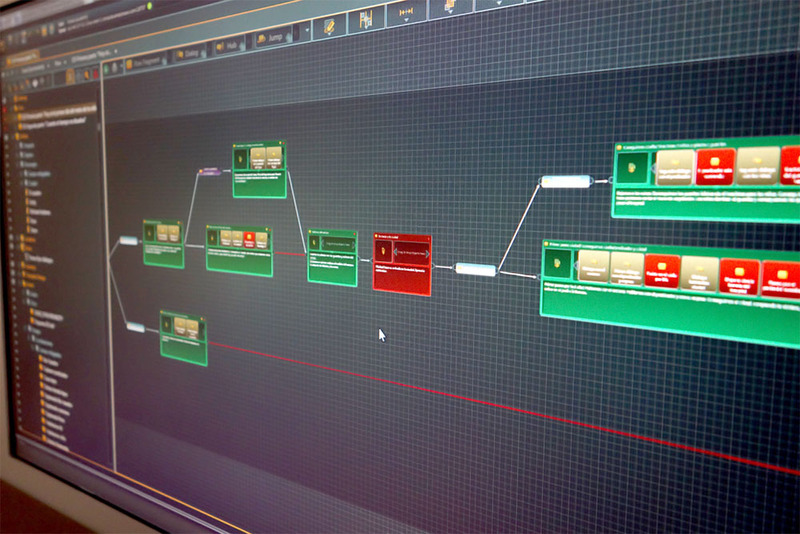 Another really important feature is the ability to design the “story flow”. Featuring an unlimited “nested” structure, one can link nodes one another and, furthermore, one can nest the connected nodes inside another node again and again, so that it’s up to one to define the complexity of the flow. It’s the same with writing nonlinear dialogue. One can create dialogue trees easily, so that, depending on the options the player chooses, new dialogue branches are opened. Furthermore, it is posible to test the nonlinear dialogues very easily. For us, the best of it all is the ability to share the whole project. 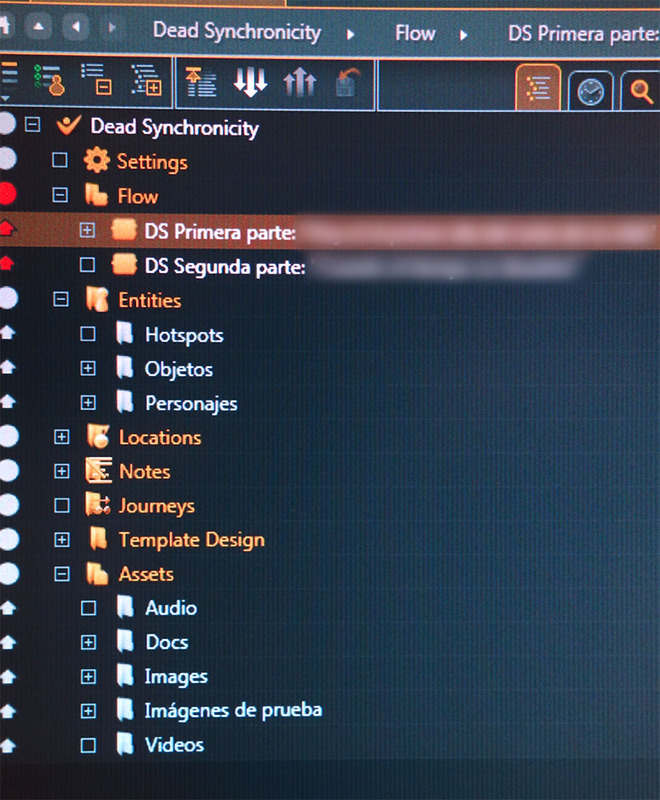 Using the articy:draft server software, a number of users might be working on the same project simultaneously. The tool features a “partition” system, so that a user may “claim” a part of the project: from that time on, and until they release it, no other user is allowed to make changes in that part of the game. It works flawlessly, and it allows us, the whole team, to have the story updated instantaneously. Last but not least, the customer service is superb. From the very moment we started using the demo version, at Nevigo they answered all our questions just instantly, and were really concerned about our suggestions. In fact, they have just released articy:draft 2.0, which includes a number of useful improvements. There are several versions of articy:draft for different needs: the single-user version, the multi-user version, the server software, the API (which you can use to connect articy:draft with a different software)… A few weeks ago, in fact, they were “greenlit” so now you can even purchase a limited cheaper version directly via Steam. In a nutshell, after a few months working with articy:draft, it has become our one and only writing tool, and we use it on a daily basis. If you’re looking for a single software to write your videogame and simplify your workflow, you should give it a try.